“You take places where the majority of shoppers are already walking, you make them a bit more bike friendly, you put in a few cycle routes covering the last mile or two in each direction and then you do a bit of advertising. These places are called High Streets”. So how does this apply to Darlington? Back in 2007, as part of our ultimately successful campaign for cyclist access to the newly pedestrianized town centre, we blogged an article about the economic benefits to retailers of cyclist shoppers, something that Kim echoes in his article. But just how convenient is it to shop in Darlington? Well, once you are in the pedestrian area, and the comfort of access to it is pretty variable, shopping right in the centre is pretty convenient. There is good quality bike parking at a number of key points around the main shopping streets, from Northgate at the north end to Blackwellgate to the south. But try almost anything else, and you soon discover that the design of the pedestrian heart was carried out without cycling in mind. 1. Travelling from the town centre to the railway station, a major route for cycling in Darlington. Starting from the Pease Monument in the centre of town, you would hope to be able to cycle down the direct route towards the station, Priestgate. But no, this is one way for motorised traffic in the opposite direction, with no contraflow for cyclists. So there are two alternative options. One is to cycle round a large detour, taking in Crown Street, to arrive at the foot of Priestgate, and then on to the officially signed route to the station via Borough Road. The second is to use the cycle path below the Town Hall, but this delivers you to the wrong side of Parkgate, one of the busiest roads in Darlington. Many cyclists opt here for the obvious and use the pavement. 2. Travelling along Skinnergate and on to Duke Street. This is part of the pedestrianised zone between 10am and 5pm, so is relatively pleasant during these hours. But before and after it is used, one way, by motorised traffic. The fact that cyclists use the street in both directions appears to have confused motorists and police alike, judging from the reactions I have received whilst cycling along. A year ago, as previously reported, one motorist felt it necessary to stop me and tell me off. 3. 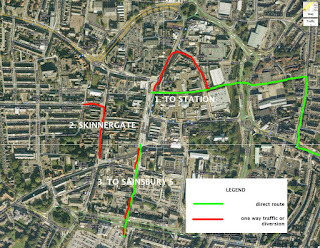 Cycling to and from the town centre to the nearby Sainsburys on Victoria Road. This supermarket is just a few minutes’ cycle from the town centre, yet there is simply no provision been made available for cycling access. Given that it lies on the dual carriageway that is the inner ring road, most cyclists choose to use pavements to access the store. Moreover, returning towards town via the obvious route (S. Arden Street), cyclists are confronted with two short one way streets going the wrong way. A market town like Darlington still has enough small shops to make shopping by bicycle a pleasant experience. But the devil is in the detail. Planners have clearly not thought through properly what shopping on a bicycle means. These three examples do not require large sums of money to resolve. rather, as Jan Gehl says, they need planners to be thinking more seriously about how to invite cyclists to shop. Shopkeepers are the last to think in the cycling direction. They think a boot takes a lot of goods so provide for the bootcarrier = car. They do not look at statistics which would tell them the truth: People with cars do not necessarily buy more than people on foot or bike. Second and more important: town planners and traffic engineers. If they do not cycle they do not understand the needs of cyclists (except for very smart and empathetic engineers and planners, they seem to be rare). And then third, there are the politicians: Why not make crystal clear that every road plan has to include pedestrians AND cyclists? And why not look at the existing town design and push for a change? Well: Most of them don't cycle. Again it needs imaginative politicians. And if not, they have to be pushed by us: civil disobedience, demos, petitions etc.. There are also small steps that could be made by traders to show that cyclists are, as Jan Gehl says, "invited". The Campaign suggested a few years back that selective shops might want to install Oxford Rings outside their premises (ie where it was practical to park a bike there without hindering others, where cycle parking was a long way away) to enable cyclists to park securely. Little cost, big gain. Research exists (Darlington Borough Council may have this)which indicates that where urban planners have made access to shops easier and more pleasant for cyclists, then people using bicycles tend to visit the town more frequently and spend longer actually accessing the retail outlets. The reasons are pretty straightforward – no time wasted searching for parking spaces and clock watching (I only have an hour on the meter)and no time wasted getting from car park to shops and back again. Provide the infratructure and the cyclist/shoppers, will come. To get fromm the Pease Statue to the Station, surely you would cross the Market Square [pedestrains and bikes allowed] and then go down through the Town Hall carpark, over the bridge at the bottom turn right and follow the signposted bikeway along the river, over the light controlled crossing and up parallel to Victoria Rd. along the indicated bike route to the Victoria road entrance and into the Station via the ramp access. Rather than the tortuous routes suggested on the blog. Don't look for problems where they don't exist. Your back lane parallel to Victoria Road stops at the post office entrance. What's more, the little bit of back lane that does exist is totally neglected with a very poor surface – it is a BACK LANE, think status – and throws you back on to the main Victoria Road. This is not a case of "looking for problems where they don't exist", more a case of "considering what is, and isn't attractive for shoppers". If you think that such a route deserves the status of official cycle route, your standards are, frankly, piss poor. And by the way, I think you have identified the root of the problem with cycling advocacy in Britain. Jan Gehl says we should "invite" cyclists into towns via high quality urban planning.. Many UK advocates want to send cyclists down back lanes and tell them that there isn't a problem. @Anonymous: For women this back lane you are suggesting is not attractive especially when it is dark like it is from half five in winter. Are you male, dear A.?? Cycling provisions have to include everybody, kids, women, elderly citizens, not just men between 25 and 55. Cheers! In reply to anonymous he “Beat me to it” for indeed the route described in the post was incorrect. Richard does however make valid points as to the route after the safe and enjoyable track beside the river and the crossing of the dual carriageway. It degenerates into a back lane which is terrible and often strewn with litter and broken glass. When the NCN route 14 was signed from the station out to Stockton and beyond I also looked closely at alternatives to the route offered by the council to take riders into the town centre and I can honestly state here there simply isn’t one given today’s traffic flow at the meeting of Victoria road and the inner ring road. The council had no alternative but to avoid this place altogether by directing riders part of the way up Victoria road via the back lane to join it well away from this terrible inner ring road / Victoria road roundabout leaving some 500 metres left to ride albeit in unfavourable but unavoidable conditions. Look at Bank Top station from the other exit / entrance and you see a wide path running under the bridge to the junction of Hargreaves Terrace, but then you get a “Funnel Effect” caused by the old buildings and the need for a bus lane. Believe me, to use this route on a cycle is inviting death at times. The comment here – “and then on to the officially signed route to the station via Borough Road”, to my knowledge neither the council cycling map nor the signage indicates this route for to take cyclists to the junction of Borough road and Yarm road to arrive at the station at the Yarm road entrance would place them in a very difficult and dangerous place indeed. 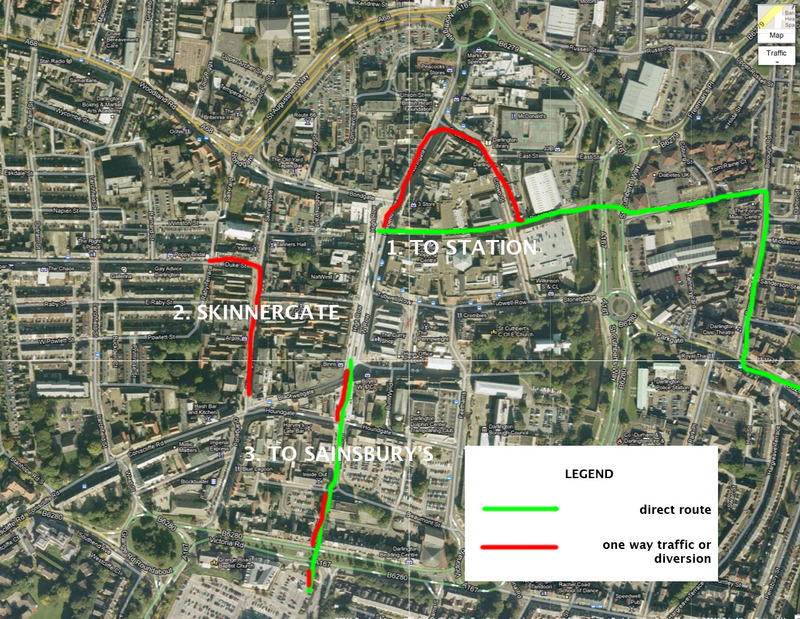 I have to totally agree with post that the infrastructure is crap in places, but I would like to see suggestions as to how the route to the station could be improved without the politically suicidal step of banning traffic from what our towns and cities suffer from, narrow streets and ring roads built when cycling was not top of the list nor – perhaps – never even considered. In light of the recent Mary Portas report on revitalising High Streets, I wanted to highlight the response to this from Sustrans: http://www.sustrans.org.uk/resources/in-the-news/dream-high-streets-are-not-just-for-christmas – do look at the research they have done, linked from that article, on how shoppers travel and note the mismatch between how retailers (who generally have more influence in the planning process) think their customers get to the shops and how / how far people actually travel. Sustrans have done some other work too on traffic restraint and vitality of town centres: http://www.sustrans.org.uk/assets/files/Info%20sheets/ff39.pdf – note the disconnect between actual shoppers’ concerns (good selection of shops, pavements not wide enough and other traffic / safety / pleasant environment-type concerns) and what retailers *think* shoppers worry about in High Streets (parking) – but this needs passing on to planning departments all over the UK to get them to take REAL concerns more into account (e.g. doing surveys of how people use a location) rather than giving the retailers too much say when it is clear that many of their views & assumptions are wrong and they wrongly give the car way too much priority, possibly with adverse effects to their business (see the "Is traffic a threat to trade" bit). We offer Manchester meet greet service i-e to collect car from airport terminal and drop the car back again at air port terminal.